Ever been to a restaurant where the few things that aren’t gluten free are marked on the menu, instead of the other way round? Well, neither had I until I visited Pho in Exeter. 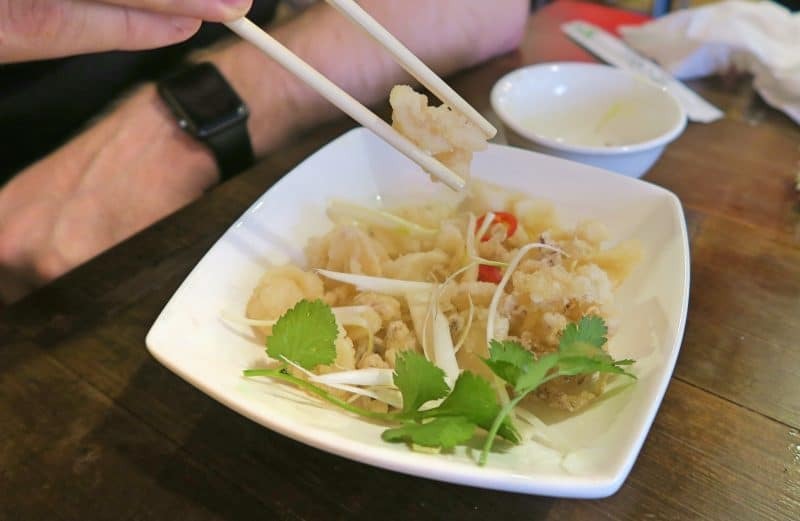 This Vietnamese restaurant, specialising in traditional noodle soup (and its namesake) pho, is accredited by Coeliac UK and an absolute heaven for those with coeliac disease looking for a gluten free treat. Usually, I avoid Asian restaurants because I assume they are filled with all the things I can’t eat, namely noodles, soy sauce, and by default, lots of gluten. However, Pho is amazing because actually, 98% of their menu is actually gluten free. The noodles are rice noodles, and the only things I could spot that I couldn’t eat were spring rolls and a couple of puddings. But when the banana fritters and waffles are gluten free anyway, who cares, right!? Living in North Devon, such exciting cuisines never normally come our way – but when I found out Pho had opened in Exeter, only an hour away, I had to find an excuse to go. In fact, I loved it so much that we actually went here twice in the space of seven days! That’s four hours of travelling for one very happy food coma. If that doesn’t speak for how good the food was, I don’t know what will! Now, if you too live somewhere a little less, er, cultured, you might find the menu at Pho overwhelming when you first look at it. Don’t let this put you off! The staff are extremely helpful and on both visits, were quick to explain the entire thing. They’ll happily give you recommendations and you’ll have just as much fun trying to pronounce everything on the menu. 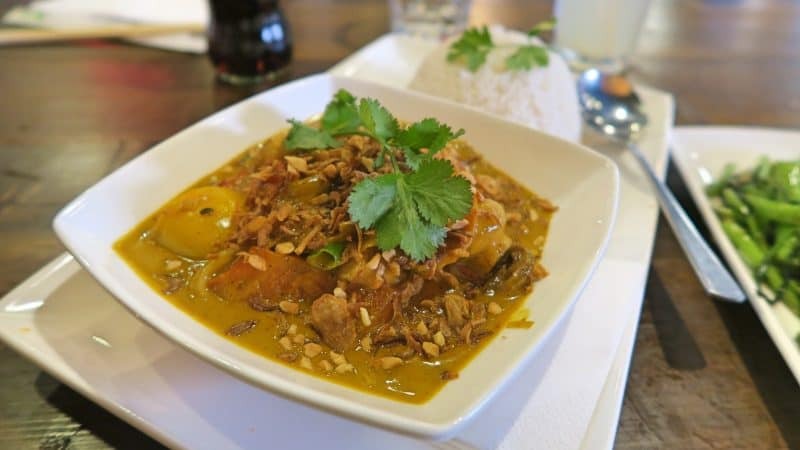 To put it bluntly, the menu briefly comprises: starters, salads, the speciality pho, rice bowls, curry, or noodles, as well as desserts, cocktails and freshly-made drinks. Oh, and I better not forget: gluten free beer. Now pretty much all of the starters at Pho are gluten free, with the exception of the spring rolls ones. Although these are starters I would love to try, there are so many more options I didn’t feel left out at all! I was so pleased we all got different ones so I could try them all. 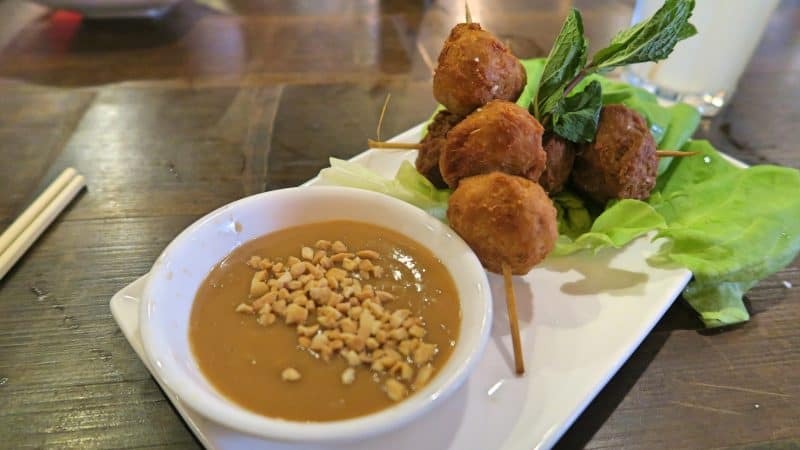 For our starters, we opted for the Gỏi cuốn, which is rice-paper rolls stuffed with herbs, vermicelli noodles and prawns (or veg/chicken if you prefer), theNem nướng, which are pork and lemongrass meatballs with an incredible satay dip. Steve opted for the Mực chiên giòn, which is baby fried squid with a salt, pepper and lime dip. 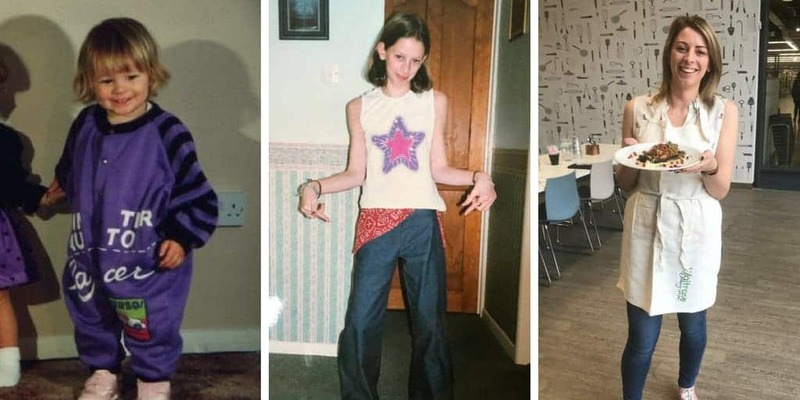 I can’t even describe which of these were my favourite, they were all so good! 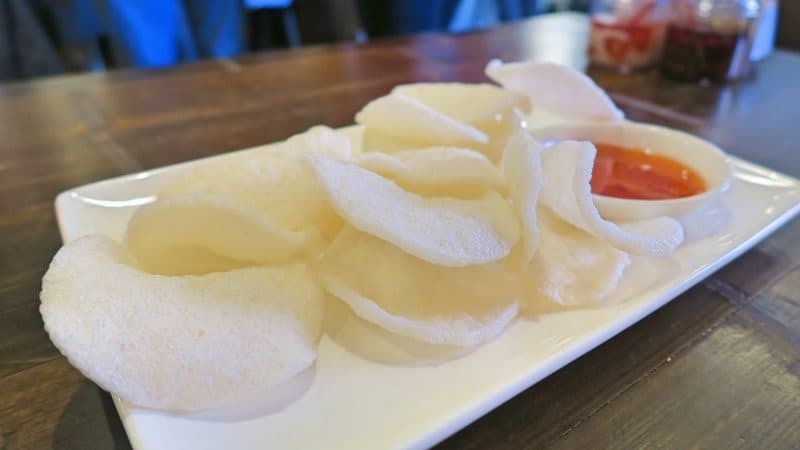 I loved the dip with the squid – you basically squirt the lime juice into the bowl of salt and chilli and make your own dipping sauce. The satay sauce with both the rice paper rolls and the meatballs was incredible! The meatballs were probably the lightest of them all. The rice paper rolls were quite filling – the first time I went I had these and then a huge bowl of pho and thought I was going to pop! But they are all so tasty, it is really very hard to resist eating them all. Obviously pho is the star of the show, but having had it on a previous visit, we opted to try some different dishes this time. To fill in the blanks, it’s this incredible (and huge!) bowl of broth with added extras of your choice. However, this is an experience as much as it is a meal! You get a plate of herbs, chilli and beansprouts to add to your meal at will, to really personalise it to your taste. This time round though, we all went for something different: the Phở Xào, which is wok-fried flat rice noodles with peanuts, the Cơm tấm đặc biệt, which is a rice bowl, and the Cà-ri, which is a rich, Vietnamise curry served with rice. To be honest, it is hard to pick a favourite because they were all, again, equally amazing. 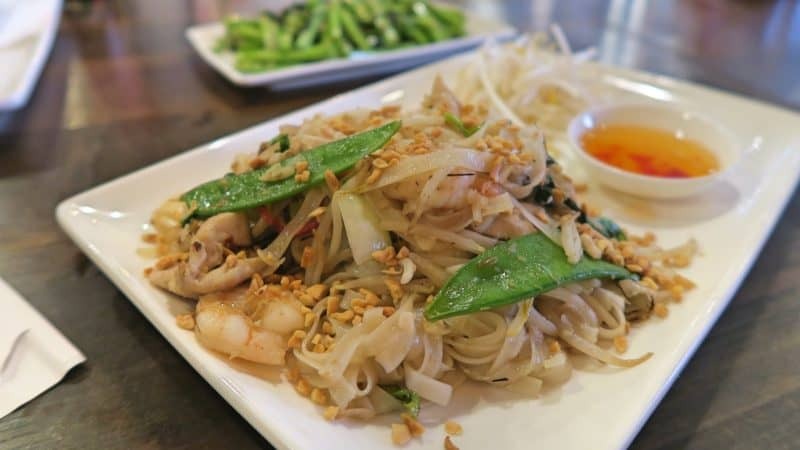 The rice noodles were a little like a pad Thai – and so delicious. They came with a chilli sauce which i really liked, so I poured it all over! The curry was rich and delicious – it was full of flavour! And the rice bowl was enormous! If I can say one thing about Pho, it’s that you certainly get your money’s worth – the portions are all very generous! 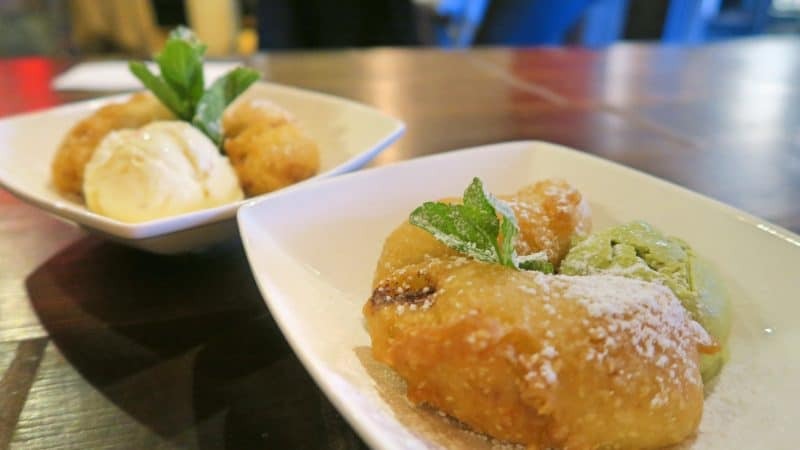 One of the most exciting things for me, even though I was absolutely stuffed after our mains, was that the desserts at Pho are largely gluten free too! And this meant for me, there was only one option: I had to try the banana fritters! The Chuối Chiên are just delicious and come with a side of various different flavour ice-creams. I tried the green tea one which was lovely! It was the perfect end to the meal, and everything I could have hoped a banana fritter would be! I mean I only have one bit of advise when it comes to eating at Pho – and that is make sure you go there! To have so much choice in a cuisine which is normally so hard to find gluten free options, I felt pretty lucky. Some might even say slightly normal! 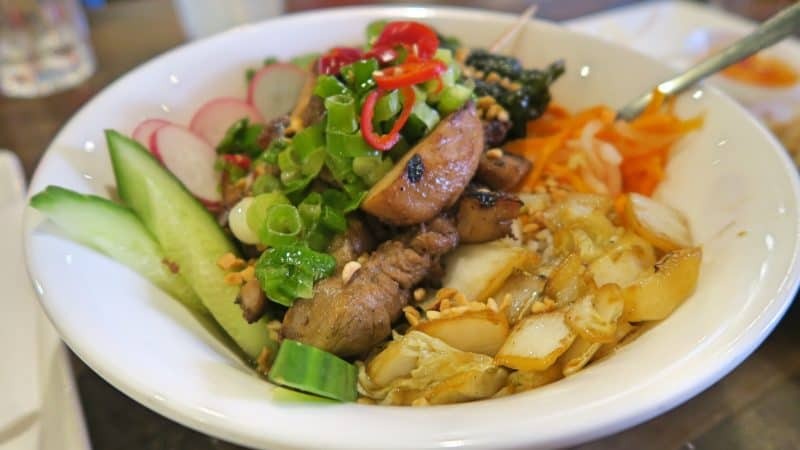 I would definitely recommend it – plus the staff are really helpful and knowledgable with the menu, and I don’t know about other Pho restaurants, but the vibe in the Exeter one was great. I can’t wait to go back again. 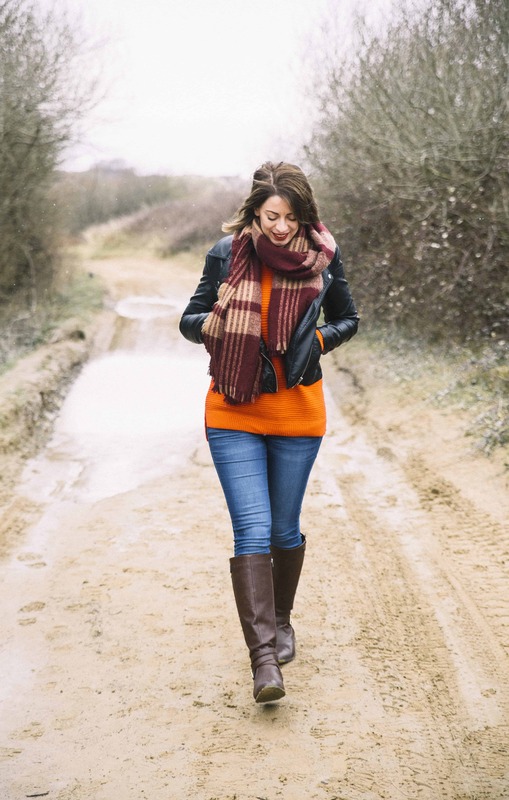 Oh – and if you’re normally more familiar with not-so-good dining experiences, check out my 18 things that happen when you eat out on a gluten free diet post for a giggle! 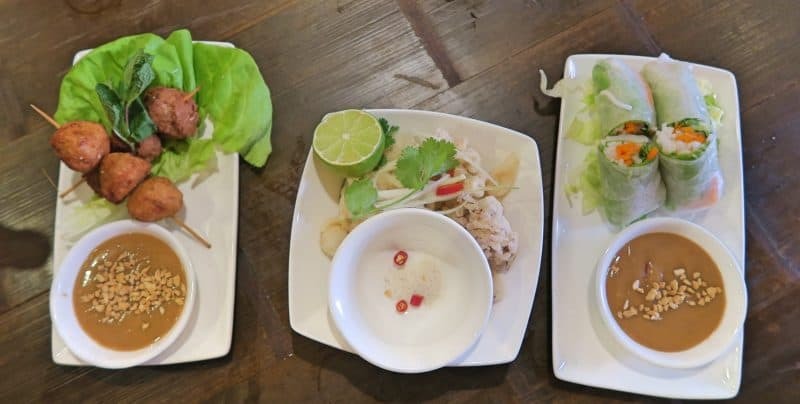 I was offered a three-course meal at Pho Exeter for free for myself and my friends in return for this review, but all opinions are, as always, my own.